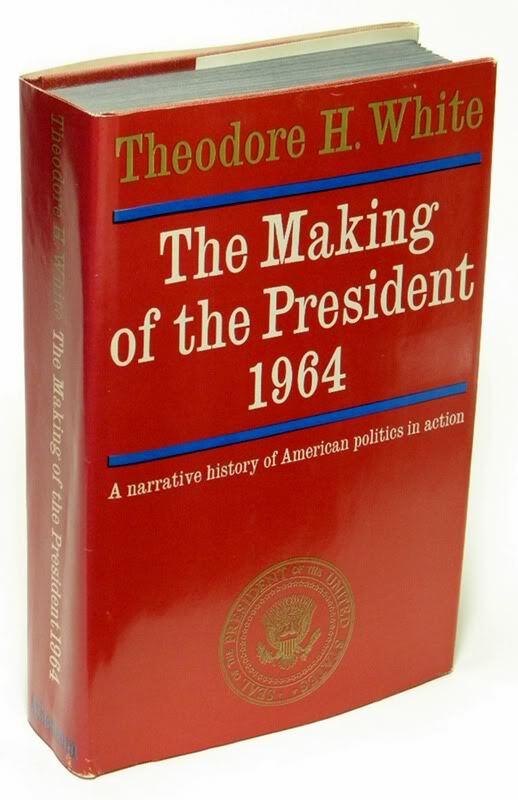 After winning a Pulitzer Prize with his groundbreaking, dramatic, psychologically intense depiction of the 1960 presidential campaign, Theodore White tried it again in 1964. But, this election lacked the drama of 1960 (most elections have) and instead, White came up with a somewhat confused narrative that paints the winning candidate, Lyndon Johnson, as both a saint and sinner, and the loser, Barry Goldwater, as a man with crazed followers with only a passing grip on reality. White’s book was published in 1965 and it came out before the United States started to come apart at the seams because of the Vietnam War and race relations, taking down Johnson’s presidency. Goldwater, who is presented as one of the least mainstream candidates ever, could have become the Conservative movement’s icon, if only the people of California hadn’t elected Ronald Reagan as governor in 1966, changing the course of American politics. The book opens with the assassination of Kennedy and the reactions to it by Johnson, the Cabinet, and the leading Republican contenders of the era: Goldwater, Nelson Rockefeller, and Richard Nixon. White, who had authored a long, laudatory piece for Life Magazine on the request of Jacqueline Kennedy, almost wants you to get on a plane to ask the Pope to make Kennedy a saint. Fortunately, the rhetoric dies down a bit. Most of the book is dedicated to the Republican campaign, which was the only contested one as Johnson opted to run in his own right. There were just 16 state primaries in 1964 (along with one for the District of Columbia for the first time). Then, as now, New Hampshire started things off. Ambassador to Vietnam Henry Cabot Lodge won that primary, mostly because of name recognition from his time as a Massachusetts senator. Goldwater and Rockefeller decided to duke it out in the last two major primaries: Oregon and California. 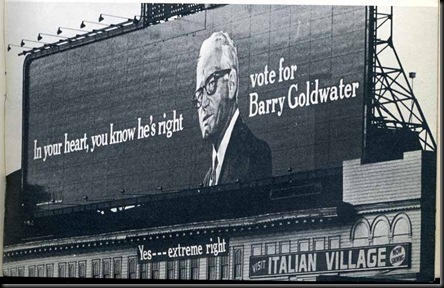 Rockefeller won in Oregon, but Goldwater won decisively in California. Goldwater was hurt by a recent divorce and, even worse, by fathering a child from his second wife during the campaign. (Two years later, the divorced and remarried Reagan would be elected governor of California.) Goldwater was then able to out organize Rockefeller in the state caucuses to sew up the nomination. Before the convention, Pennsylvania governor William Scranton tried to enter the race, hoping for a draft from liberal Republican delegates. Scranton planned to make an appearance at a governors’ conference in Cleveland with Dwight Eisenhower, but the former President would not make a public appearance with Scranton, whose candidacy quickly died. I would remind you that extremism in the defense of liberty is no vice. And let me remind you also that moderation in the pursuit of justice is no virtue. Johnson’s biggest problem during his campaign was finding a running mate. Some assumed that Robert Kennedy would be a logical and/or sentimental choice. But, the two men never got along (a bit of an understatement) and Johnson turned to two Minnesota Senators: Hubert Humphrey and Eugene McCarthy. Since Humphrey had helped passed the Civil Rights Bill earlier in 1964, Johnson owed him the favor. Ahh, but how would have things been different if McCarthy had won the job. Goldwater also voted against the Civil Rights Bill, although he said he did so on Constitutional grounds. Goldwater refused to play his version of the race card against Johnson by playing to the fears of white Americans, but he had those voters sewn up already. White pointed out that Johnson ran as an almost nonpartisan, apolitical candidate who would unite the country. This was in spite of the fact that Johnson was one of the most partisan politicians ever elected President. The election was not close. Johnson took home 61.1% of the popular vote, a record at the time. He won 446 electoral votes to 52 for Goldwater, who won five states in the Deep South as well as Arizona. Johnson came back to the White House figuring that he would be the most popular President since Franklin Roosevelt in 1936. He could only dream of that. If you were alive on April 12, 1945 and learned that Harry S. Truman had become President of the United States after the death of Franklin Roosevelt, you likely would not have been filled with confidence. Truman was a relatively unknown former Senator from Missouri. He was a product of a corrupt political machine in Kansas City. He did not have a college degree. He had not been overly successful in his private life. In his first few months on the job, Truman had to figure out how to bring about a successful end to World War II, whether or not to unleash atomic weapons on the world, and deal with an ever-growing threat from the Soviet Union, a threat potentially more dangerous than the threat from Germany and Japan. Mao Tse-Tung was leading a Communist revolution in China. Harry Truman seemed like he was ill-prepared to handle these challenges. His honeymoon from criticism barely lasted until the end of 1945. He was one of the least popular Presidents (in terms of approval ratings) in the 20th Century. And yet, Truman pulled off one of the biggest upsets in American politics when he was elected in 1948. And after that, Truman’s popularity dropped even more. Despite all of this, historians now rank Truman as one of the greatest Presidents not named Lincoln, Washington, or Roosevelt. How did Truman pull all this off? Robert Dallek, who appeared earlier here in a biography of John F. Kennedy, shows how Truman’s ability to quickly master the rapidly changing world situation, combined with an almost seeming disregard for what was politically popular, but confidence in knowing that he was doing what was best for the country, turned him into one of the most effective Presidents of the 20th Century. On the other hand, Truman has to take responsibility for ordering the atomic bombs to be dropped on the cities of Hiroshima and Nagasaki. The nuclear arms race began while he was President. The United States fought a bloody war in Korea that is officially not over. Harry S. Truman (the S was not an initial it was just a letter as his parents could not agree which side of the family should be honored by the middle name) was born on May 8, 1884 in Lamar, Missouri. His parents moved around to various farms in Western Missouri before settling in Independence, just outside of Kansas City in 1890. Truman was a bright child, but did not get a chance to go to college for financial reasons. Truman worked in a series of odd jobs: mailroom clerk, railroad timekeeper, farm hand. In 1917, Truman signed up with a Missouri National Guard unit that went to France to fight in World War I. (He had been a member earlier in his life, mainly in an attempt to meet more influential people.) Truman became an officer in the National Guard and won plaudits for his bravery in combat. When Truman returned to the U.S., he felt comfortable enough with his station in life to marry his longtime sweetheart, Bess Wallace. That same year, Truman and a friend opened a haberdashery in Kansas City (I rarely ever see the word “haberdashery” written anywhere except Harry Truman biographies.) The business went bankrupt in 1921. During his war service, Truman also became friends with the nephew of Kansas City’s political boss, Thomas Pendergast. Truman aspired to a career in politics. Pendergast was looking for someone who could run for a position as one of the judges of Jackson County, Missouri. (This was an administrative, not judicial position.) Jackson County is the largest of the four counties that make up Kansas City, Missouri. Truman won the election in 1922, lost in 1924, and then was elected again in 1926, 1928, and 1930. Although Pendergast was a classic big city political boss who made his living on kickbacks, Truman worked hard and honestly at the job. He supervised road construction in the county. And, during the throes of the Great Depression, helped to coordinate aid to unemployed citizens as best he could. By 1932, Truman wanted to run for higher office. He aspired to be governor of Missouri, or possibly win a seat in the House. But, Pendergast said no. It would not be until 1934, when fortune smiled upon Harry S. Truman. Missouri had a Republican senator up for reelection in 1934. The leading Democratic challenger to him was a rival to Pendergast. So, Pendergast tapped on his friend Harry Truman to run in the primary. It turned out to be a three-way contest between Truman, the Kansas City candidate, a St. Louis-backed candidate, and a reform candidate both the St. Louis boss and Pendergast hated. Truman won the primary by 40,000 votes and had an easy win in the general election. The Democrats had a majority of 71 seats at one point during Truman’s first term. This was a problem for a freshman senator because it was hard to stand out when nearly every bill suggested by the White House sailed through the Senate easily. Truman would face a stiff primary challenge in his 1940 reelection bid by Missouri Governor Lloyd Stark. His patron, Tom Pendergast, was now serving a prison sentence for corruption. Stark was considered a heavy favorite by political pundits in Missouri. However, Stark was also trying to get to be Franklin Roosevelt’s running mate in 1940. Truman jumped on this to point out that Stark was not fully committed to the people of Missouri. Also, Truman was able to portray himself as a strong defender of the New Deal. It proved to be just enough as Truman won the primary by 8000 votes. A general election victory followed. World War II would give Truman a chance to show that he could be an effective senator. After touring numerous defense plants, Truman realized that the American war effort was hampered by widespread waste. Truman chaired a committee to investigate the matter. Truman’s committee turned up millions of dollars wasted, contracts granted without bids, and price fixing. Publicly, Truman’s committee was a success because it managed to punish both labor and management. Roosevelt wanted a new VP, but he did not want to look like the bad guy. Wallace was sent off to visit China and Russia to be kept out of the picture. Roosevelt thought of asking two different Supreme Court justices, Thomas Byrnes and William O. Douglas, but both declined. Byrnes was also considered too conservative and Douglas too liberal. In the end, Roosevelt and Democratic Party leaders settled on Truman. He was neither too liberal nor too conservative. He was considered loyal. He would do what he was told. And so Truman got the nomination. Benjamin Harrison ran for President twice and never got the most popular votes. Republicans chose him to run because he both a famous name (his grandfather was William Henry Harrison) and he came from an important swing state at the time (Indiana). Few of us would likely be able to name any of his accomplishments. Charles W. Calhoun, a professor at East Carolina University (which is in North Carolina, unlike Coastal Carolina University which is in South Carolina) who is one of the most prominent historians who study the Gilded Age, manages to both humanize Harrison while also elevating his place in history. Benjamin Harrison was President in a time when power shifted between Republicans and Democrats often. Populist political movements threatened to take down the establishments of both parties. There were violent strikes affecting crucial industries and widespread dissatisfaction with the nature of the economy. Harrison’s four years in office were far from tranquil. The man in charge of the country during this time was a Born Again Christian Republican who favored a big government, a high tariff, and increased civil rights for African-Americans. He had majorities to work with in Congress for his first two years, but could only pass a portion of what he wanted. Harrison’s boldest ideas (in the area of civil rights) fell victim to Senate filibusters and political horse trading. After graduating in 1852, Harrison apprenticed with an another attorney to learn the law. He married Caroline Scott in 1853, passed the bar in 1854, and moved to Indianapolis to seek his fortune. Harrison wanted to move out of Ohio because he did not want to trade on his family name to get ahead. Harrison quickly built a reputation as an excellent attorney, especially in criminal trials. In 1857, the people of Indianapolis chose him as the city attorney. In 1860, Harrison won the office of reporter of the Indiana Supreme Court. This job, which paid well, required Harrison to print, publish, and sell all the opinions of the state courts. When the Civil War began, Harrison first declined to join the Union Army because of family obligations. But, in 1862, Harrison decided to enlist and he became a colonel in command of a regiment of Indiana volunteers. Harrison did not see much action until 1864 when his regiment joined in General William Sherman’s Georgia campaign. Calhoun believed that Harrison saw more battles during that Georgia campaign than his grandfather did in his nearly 30 years in the Army. Harrison was a Brigadier General when the war ended. Harrison won another term as Supreme Court reporter for Indiana in 1864, despite his military obligations. While he received offers to run for higher office, Harrison declined them until 1872, when he tried to win the Republican nomination for governor of Indiana. However, Harrison did not prevail at the state convention. In 1876, Harrison did get the nomination after the first nominee dropped out of the race. Harrison lost to the Democratic candidate, James Williams, by about 5,000 votes. Harrison’s strong showing in the governor’s race started to get people talking about him as a Presidential candidate in 1880. Harrison’s time had not come though. James Garfield won the Republican nomination as a dark horse choice and, ultimately, the Presidency. In 1881, Harrison finally got a chance to shine when he won a Senate seat. Harrison did not compile a distinguished legislative record, but he was still regarded as a possible contender in the 1884 Presidential race. But, in 1884, perennial contender James G. Blaine of Maine won the nomination. Harrison and fellow Hoosier, Postmaster General Walter Q. Gresham, ended up in a bitter feud over whom the Indiana delegation should support. This ultimately took away any chance either man had of winning nomination as President or Vice President. Blaine lost to Democrat Grover Cleveland, the first Republican to lose a Presidential election since John C. Fremont in 1856. Back in Indiana, the Democrats had managed to gain control of the Legislature through a redistricting measure. The Indiana legislature did not reelect Harrison in 1887, choosing Democrat David Turpie by one vote. In 1888, President Cleveland appeared to be a vulnerable incumbent. Cleveland had shepherded a tariff reduction act that was extremely unpopular in the Northern states, which were dependent upon protective tariffs for their industries. The Republican race for the nomination in 1888 was wide open after Blaine announced he would not run. Harrison and Ohio Senator John Sherman were the front-runners, but no one had a wide base of support. Interest in the election was huge. The tariff was the main issue and that was causing the North and South to dig in deeply along partisan lines. It was likely that a few key swing states, such as Indiana, would be crucial. The election had its seamy sides to it. A Republican partisan in California wrote a letter to the British minister to the United States, Sir Lionel Sackville-West, pretending to be a British subject with the name of Murchison. “Murchison” asked Sackville-West which candidate would be better for England. Sackville-West wrote back that Cleveland would be preferable. The letter was made public, stirring up a fury among Irish-Americans. The Republicans would also be caught in a scandal known as the “Blocks of Five.” A Republican Party official instructed Indiana precinct captains to divide all undeclared voters into “blocks of five” and use an appropriate amount of money to buy their votes. It is generally believed that Harrison was ignorant of this scheme. When the votes were all counted, Cleveland had won the most popular votes by a margin of 90,000 (48.6% to 47.8%). But, Harrison prevailed in the electoral vote by a margin of 233-168. Harrison won the crucial states of New York (36 electoral votes) and Indiana (15) by less than 1%. The vote broke along almost completely along sectional lines. When Harrison formed his Cabinet, he made Blaine his Secretary of State and William Windom his Secretary of Treasury. Both men had held these positions while James Garfield was President, but had stepped down after Garfield’s assassination. The Republicans in the new 51st Congress did not waste much time in trying to enact much of Harrison’s agenda. The government was running a large surplus at the time (about $100 million) and there was plenty of spending to go around. Civil War veterans pensions were extended. Tariffs were raised. In 1890, the Sherman Antitrust Law went into effect, the first Federal law enacted that to prohibit unfair business cartels and monopolies. Although Harrison’s Administration would not do much to enforce the act during his time in office, the Sherman Antitrust Law is the cornerstone of all antitrust law in the United States today. John Sherman, besides the antitrust law, also gave his name to another important law dealing with the economy, the Sherman Silver Purchase Act. Western farmers wanted to increase the amount of silver used as legal tender because: 1) they were in debt and needed more money and 2) there was a lot of silver around in the West. Eastern financiers did not want silver in circulation for fear of it hurting the price of gold and creating inflation. Farmers did not mind inflation because their debts were not going to going up because of them. The Silver Purchase Act required the government to buy some silver every year and issue bank certificates that could be exchanged for either gold or silver. This compromise was supposed to give Harrison and the Republicans some breathing room from a growing populist movement in the West. Ultimately, the plan would not work in any way. Another law Harrison tried to get through Congress in 1890 was a Civil Rights Bill. Sponsored by Representative Henry Cabot Lodge of Massachusetts, the bill would have allowed the Federal government to supervise any Congressional election after receiving a petition from a specified number of citizens. Southern Democrats filibustered this bill and threatened to do the same to the Silver Purchase Act. The Republicans decided that silver trumped civil rights and backed off on the legislation. The 51st Congress became known as the Billion Dollar Congress for the amount of spending it authorized. In the 1890 off-year elections, Democrats hammered the Republicans for the excessive spending. The Republicans, who had controlled the House by a 172-159 margin, found themselves in a 236-88 hole after the 1890 election. Because of new states joining the union (North and South Dakota, Montana, Washington, Idaho, and Wyoming), the Republicans did maintain a majority in the Senate. With a hostile Congress making it impossible to accomplish anything on his domestic agenda, Harrison spent much of his final two years concentrating on foreign affairs. The United States ran into problems with Canada (and, by extension, Great Britain), Italy, and Chile. The problem with Canada was the hot button issue of pelagic sealing. The United States had granted a company a limited license to hunt seals on the Pribilof Islands of Alaska. The company was not allowed to hunt the seals in the open ocean (pelagic sealing.) Canadian sealers believed that once the seals reached international waters, they were fair game, and part of the unique Canadian right to beat up baby seals. The dispute with Chile was also in 1891 when some sailors from the U.S.S. Baltimore were attacked by a mob in Valparaiso while on shore leaves. Two sailors were killed. Harrison did get Chile to apologize and pay a small indemnity ($75,000). Harrison ended up doing much of the work of Secretary of State James Blaine. The former Maine Senator was not a hard-worker, which rankled the industrious Harrison. Further complicating matters, Blaine was suffering from kidney disease. Blaine was openly contemptuous of Harrison’s performance as President, while Harrison found Blaine to be a lazy slugabed. Harrison did want to dump his Vice President, Levi Morton. Morton had done little to advance Harrison’s legislative agenda in the Senate, especially the Civil Rights Bill. So, Morton was sent packing and New York newspaper publisher Whitelaw Reid was put on the ticket. The Democrats decided to go with former President Grover Cleveland. He had won the popular vote in both of his earlier runs, so why mess with success? Adlai Stevenson was nominated for Vice President. 1892 was a turbulent year in the United States. A strike at an Andrew Carnegie-owned steel plant in Homestead, Pennsylvania, turned deadly when striking workers fired on Pinkerston agents hired as strikebreakers. Four people died in an exchange of gunfire. The Pennsylvania National Guard had to come to Homestead to restore order. The growing populist movement among Western farmers had finally coalesced into an actual third party. The group named itself the People’s Party, but was more commonly called the Populist Party. James B. Weaver of Iowa would be its standard bearer in the Presidential Election of 1892. The Silver Purchase Act was not having its desired effect. Nearly everyone given a greenback that they could exchange for either silver or gold, opted to take gold. This created a serious drain on gold reserves, as well as concentrating more wealth in the East. Amidst the Presidential campaign and economic crises, Harrison’s wife, Caroline, was dying. At first doctors did not know what was causing her general weakness. Tuberculosis turned out to be the culprit. On October 25, 1892, two weeks before Election Day, Caroline Harrison passed away. Out of respect, Cleveland ceased campaigning, so as not to take advantage of Harrison’s grief. The final days before the election were grim as Harrison faced a likely defeat to go along with his wife’s passing. Cleveland won his rematch with Harrison. He edged him in the popular vote by about 400,000 votes nationwide. Cleveland won 277 electoral votes. Harrison won 145. Weaver won four Western states worth 22 electoral votes. Soon after Cleveland took office, the economy collapsed. 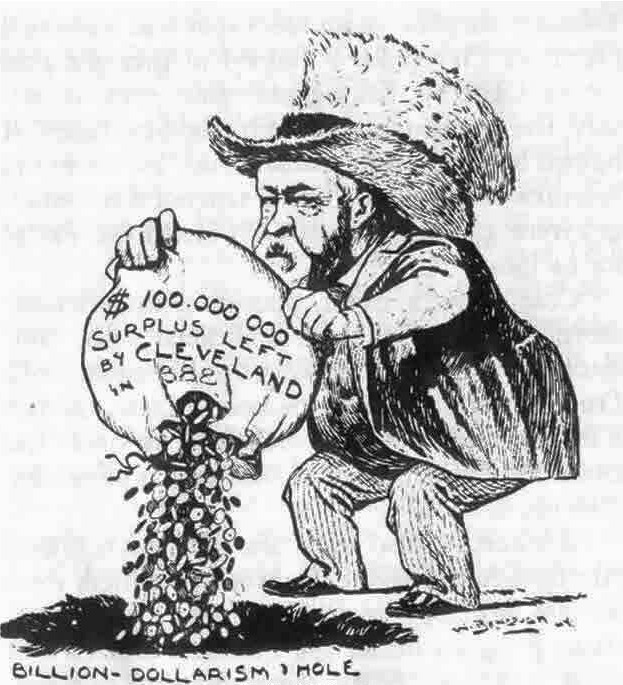 Cleveland’s economic policies were not much different from Harrison’s however. It would take the better part of four years for the economy to regain its strength. In retirement, Harrison worked as a trustee for Purdue University. He also resumed his law practice on a limited basis. In 1896, Harrison remarried. His late wife’s niece, Mame Dinnick, was a 38-year old widow, who had long been a close family friend of both Benjamin and Caroline Harrison. Harrison’s daughter and son refused to attend the wedding of their father, accusing Mame Dinnick of carrying on an affair with their father while their mother was dying. (Calhoun does not put much stock in that accusation.) In 1897, Harrison fathered a child at the age of 63. In 1900, Harrison traveled to The Hague to argue a border dispute for Venezuela against Great Britain. Harrison brought his new family along with him. The job was taxing. Harrison wrote nearly all of an 800-page brief for the arbitrators. Harrison and the Venezuelans lost the case. In February of 1901, Harrison developed a cold. This turned into pneumonia, which proved fatal to him on March 13, 1901. Benjamin Harrison’s story is one not often mentioned in history books. He is remembered more for being the last President to wear a beard. Harrison, like many politicians of the Gilded Age, owed much of his success to friends in high places. Politicans from this era are rarely judged on their ideas, but mostly on the company they kept. Harrison was an honest man (especially by Gilded Age standards) who never had broad appeal to the rest of the United States. The nation was still not completely over the effects of the Civil War. Harrison made some effort to edge the United States into a more modern era of politics. But, it would take the next two Republican Presidents, William McKinley and Theodore Roosevelt, to revamp the American political system. Other stuff: Benjamin Harrison’s birthplace was also the home of William Henry Harrison at the time. The home is not there anymore, but there is a marker. Harrison’s home in Indianapolis is now a museum run by the President Benjamin Harrison Foundation. Harrison is buried next to both of his wives at Crown Hill Cemetery in Indianapolis. Harrison’s White House was the first to have electric lighting. In general, the Harrisons were afraid to touch any switches as they thought they would be electrocuted. They tended to leave the lights on. If you mention the name William Henry Harrison to most people, the initial reaction will be “I don’t know anyone by that name.” So, after you get past the people who are completely ignorant of the man, you might get the reaction of “Oh, the guy who died after a month in office as President.” And after you get past those people, you get the people who say, “Wasn’t his nickname ‘Tippecanoe’?” Then you run into someone who is a direct descendant of Tecumseh, and you get punched in the face. Finding a biography of William Henry Harrison was not an easy task. The book I found was published in 1939. And, it goes on for 343 pages, not counting the end notes, bibliography, and index. And Harrison does not get elected President until page 329. There was a lot to slog through. In the end, I learned that perhaps one reason people do not write full-length biographies of William Henry Harrison is that is he was not very interesting. Freeman Cleaves, who wrote mostly about the Civil War, penned a lengthy book that utters nary a bad word about William Henry Harrison. Either Harrison was beyond reproach, or he was incredibly boring. You could decide if you read the book, but you do not have to. I have read it for you as a public service. This public service does not extend to telling you if William Henry Harrison was a good person. But, I do know a lot about Indiana in the early 19th Century now. The life of William Henry Harrison is somewhat interesting. It is not 343 pages worth of interest, but it is a little more interesting than reading about Millard Fillmore. William Henry Harrison was the youngest child of Benjamin Harrison V, a signer of the Declaration of Independence, and Elizabeth Bassett. He was born on February 9, 1773 on the Berkeley Plantation in what is now Charles City, Virginia. When he was 14, Harrison went off to Hampden-Sydney College. But, after two years, Harrison left when the college changed its religious affiliation from Episcopalian to Methodist. Harrison then was going to try his hand at medicine and enrolled at the University of Pennsylvania, but he dropped out because his family told him that there was not enough money for him to stay in school. So, Harrison decided to join the Army. He received a commission as an ensign in the Army in 1791. The United States Army was not a prestigious institution at the time. The country feared a large standing army. Almost all of the forces were stationed in what was then called the Northwest Territory (think Big Ten Conference.) The Army posted Harrison to a fort outside of Cincinnati. Harrison quickly moved up the ranks. He distinguished himself at the Battle of Fallen Timbers (near Toledo) in 1794. This battle, along with the subsequent Treaty of Greenville (negotiated by Harrison) brought some peace between American settlers and a confederation of Great Lakes area Indian nations. In 1795, Harrison married Anna Symmes, daughter of a prominent judge in Ohio. They would have 10 children together, nine of whom lived to adulthood. Harrison settled down in 1797 and was appointed to the job of Secretary of the Northwest Territory. Two years later, Harrison won the election for the territory’s non-voting delegate in Congress. This job is similar to positions today held by people from exotic places like Guam and the District of Columbia. In 1801, outgoing President John Adams appointed Harrison as the first territorial governor for the new territory of Indiana. Harrison moved his family to the bustling metropolis of Vincennes, the capital city. Harrison tried to attract settlers to Indiana. He had two approaches. One was to relax prohibitions on slavery and indentured servitude in the territory. The other was to make sure that some of the Indian tribes that did not sign the Treaty of Greenville did not make any trouble. By 1809, the Indiana Territory was allowed to choose its own legislature. This body had a pro-abolition majority that voted to prohibit slavery in the territory. In that same year, Harrison negotiated another treaty, this one with the Delaware, Wea, Kickapoo, and Potawatomi nations that allowed white settlement along the Wabash River. Tecumseh, along with his brother Tensketawa, ratcheted up the tension. Harrison and Tecumseh traded accusations and slurs against each other. On November 6, 1811, Harrison decided to lead an expedition against Tecumseh’s forces at an encampment called Prophetstown (Tensketawa was also known as The Prophet.). This encampment was near the confluence of the Wabash and Tippecanoe Rivers. The forces led by Tensketawa made an attack on Harrison’s forces, but we were driven back, suffering heavy losses. Harrison received wide acclaim for this victory at what would be called the Battle of Tippecanoe. He also received criticism for not continuing the battle and capturing or killing Tecumseh and Tensketawa. While Winchester and his men were well fed, they were also sitting ducks for a large force leaving from Detroit under the command of British General Henry Procter. Tecumseh’s men were also part of the contingent. Winchester’s troops were caught by surprise. Nearly all of them were killed in an engagement known as the Massacre of the River Raisin. Nearly 400 men were killed, with the rest taken prisoner. Those taken prisoner were almost all subsequently killed. Avenging this defeat became of primary importance to the United States. Harrison was able to marshal his forces, augmented by more Kentucky militia eager to avenge the deaths of their comrades. Aiding this cause was a spectacular naval victory on Lake Erie by Commodore Oliver Perry. Procter now faced a nearly impossible situation in trying to resupply his troops. So, Procter ordered a retreat. Harrison and his men pursued Procter, along with Tecumseh, and finally engaged them near the Canadian city of Moraviantown on October 5, 1813. The American forces routed the British and Indian forces in what would become known as the Battle of the Thames. During this battle, someone killed Tecumseh. No one knows for certain who it was, although Colonel Richard Mentor Johnson of Kentucky would take credit for it in public, and parlay that into election as Vice-President in 1837. Despite the victory, Harrison still received criticism from the Secretary of War, John Armstrong, over spending on supplies. Harrison resigned his commission and Andrew Jackson was given the command of the Army in the West. The War of 1812 would last into 1814 and most of Washington, D.C. would be burned to the ground by British troops. In the aftermath of the war, Harrison decided to leave the world of the military behind. He won election to the House of Representatives from Ohio in 1816, riding in on a wave of anti-incumbency. Prior to the 1816 election, Congress had voted to change its pay scale from eight dollars a day to $1500 for an entire two-year term. Since Congress met for about five months a year at the time, this was a big salary boost. The public outcry was enormous. When the new Congress convened in 1817, the salary reverted back to a per diem, at nine dollars per day. Harrison supported this measure, although he did not do much else of note in Congress. In 1820, Harrison ran for Governor of Ohio, but lost. In 1824, he was chosen to the United States Senate by the Ohio Legislature. In 1828, Harrison was given the title of Minister to Colombia. He ventured by ship through the Caribbean to Maracaibo in Venezuela. Eventually, he took a 10-day trip by mule to the Colombian capital of Bogotá. There he met Cololmbian President Simon Bolivar. Bolivar, who had been the Great Liberator, was now bordering on becoming the Great Dictator. Harrison sent dispatches back to Washington, warning of Bolivar’s increasing paranoia and restrictions of personal liberties. But, Harrison was not in Colombia long. In 1829, Andrew Jackson became President and appointed a new minister to Colombia. Harrison returned home to Ohio. For several years, Harrison had little to do. He managed his estate (which was not overly profitable). He welcomed back veterans of his various campaigns. He wrote books, and had books written about him. In 1836, the Whig Party decided on a unique strategy for the Presidential election. Instead of nominating one candidate, the Whigs would nominate several candidates, each of whom was supposed to be very popular in one part of the country. The hope was then to split the electoral vote and send the election to the House. This plan had several flaws. First, the Democrats controlled the House and would win any election there. Second, it is hard enough to find one good presidential nominee, let alone two or three. In 1836, the Whigs nominated four candidates: Daniel Webster, Hugh White, Willie Mangum, and Harrison. Harrison was chosen because of his military background and his popularity in the West. Harrison did not have to do much after the 1836 election to become popular. In 1837, the nation went into a scary depression known as the Panic of 1837. Credit markets dried up and tens of thousands of people were left in poverty. Van Buren could not solve the economic mess (or did not have enough time for the economy to right itself) and he was going to be an easy target in the Election of 1840. Henry Clay saw 1840 as being his chance to finally win the Presidency. But, it was not to be. Clay had made too many enemies. Harrison was the choice of the Whig Convention. The congenial general from Ohio would run for President despite being a relatively elderly 67 years old at the time. The presidential campaign of 1840 was groundbreaking. The campaign would not be about the issues, but about personalities. Van Buren was portrayed as an out of touch aristocrat. Harrison was the hard working military hero. 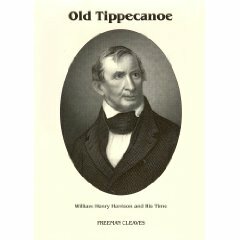 The Whigs also adopted a campaign slogan of “Tippecanoe and Tyler too” to emphasize Harrison’s military background. A large paper ball was rolled through various cities after Whig candidates won local elections. The idea was “to get the ball rolling for Harrison!” After the victory, the names of the winning candidates would be written on the ball. Harrison, contemptuously referred to by Clay as nothing more than “a Trajan”, beat Van Buren easily, winning 19 of 26 states for 234 electoral votes. Harrison won nearly 53% of the popular vote. Not many people knew which issues Harrison campaigned on. They just liked him, and he seemed better than Van Buren. Harrison believed in a national bank, the supremacy of Congress to the President (which meant almost no vetoes), Federal funding of internal improvements, reform of the spoils system, and a promise to serve one term. When Harrison got to Washington, he was greeted as a hero. He was also besieged by job seekers. He picked a Cabinet and planned to have all major decisions ratified by its members. The stress of the transition quickly began to wear Harrison down. Hundreds of people would see Harrison each day, begging for a job. The Whigs wanted to get rid of all the Democrats in office. Harrison wanted to take a more restrained approach. But, after eight years of Jackson and four years of Van Buren, the Whigs wanted their share of Federal jobs. Harrison was inaugurated on March 4, 1841 on a cold and wet day in Washington. He gave the longest inaugural address in history, over 8,000 words, and that was after Daniel Webster heavily edited it. With the poor weather and the long speech, many of the estimated 50,000 in attendance stopped paying attention and left. History books tell us that Harrison picked up a cold during his inaugural address because of the poor weather. However, most doctors would tell you that cold weather itself will not make you sick. But, a 68-year old man, under a high amount of stress, living among many unfamiliar people in crowded conditions, is a good candidate to pick up a virus from someone. Harrison’s cold turned into pneumonia. And, even today, you do not want to get that. His health quickly deteriorated. On April 4, 1841, William Henry Harrison became the first President to die in office. William Henry Harrison went from President to historical footnote. Other stuff: Harrison’s birthplace, the Berkeley Plantation is available for visits and run by a private foundation. William Henry Harrison was laid to rest in a tomb in North Bend, Ohio. The tomb is maintained by the Ohio Historical Society. Harrison’s estate in Vincennes, Indiana was called Grouseland, and it is available for visits. Tippecanoe Battlefield Park is a National Historic Landmark, although it is maintained by the state of Indiana. Tecumseh’s final resting place is unknown. He does have a line of air conditioners named after him. And noted Civil War general William Sherman has the middle name of Tecumseh. The battlefield for River Raisin was designated as a National Battlefield Park on March 30, 2009. William Henry Harrison’s grandson, Benjamin, would become President in 1889. Benjamin was the son of John Scott Harrison, who served in the House of Representatives for Ohio. Harrison’s brother, Carter Bassett Harrison, was a member of the House for Virginia. Harrison’s great-great-grandson, also named William Henry Harrison, represented Wyoming in the House. Richard Milhous Nixon was the first President I ever knew. He became President when I was three years old. He left office when I was all of eight. To me, he was the image of what the President of the United States is supposed to be. You can make of that what you will. For a man who was not easy to like, he was elected President twice, once by a slim margin and the other time in a landslide. Nixon made himself into one of the towering figures in American foreign policy. But, his legacy is one of paranoia that fueled an unprecedented abuse of power by the Executive branch. In trying to be a statesman, Richard Nixon ended up a pathetic figure, even though history seems to be treating him better now. One person not treating Richard Nixon better now is Elizabeth Drew, the longtime Washington correspondent for the New Yorker magazine. Nixon would likely be appalled that someone like Drew, an East Coast journalist and Wellesley alumna, is trying to write about his life. Drew paints a picture of Richard Nixon as a man who was deeply troubled. He was often depressed. He was often paranoid. He drank to excess. He could not form friendships or make small talk. And in Drew’s view, he was unfit to hold office and the nation was fortunate that Nixon did not steer the nation into a disaster. Nixon hoped to attend an Ivy League law school after he graduated second in his class at Whittier. Finances again did not allow that. Nixon settled for going to Duke University Law School, which offered him a scholarship. After gaining his degree, Nixon returned home to Whittier to set up his own practice. One of Nixon’s interests was community theater. He met a woman named Thelma Ryan, who went by Pat, after being cast in a play with her. Nixon pursued her, even to the point of driving her to dates with other men. Eventually, the two married in 1940. They had two daughters, Julie and Patricia. When World War II started, Nixon served in the Navy. While not seeing any combat, Nixon did receive commendations for his work, which was almost all logistical. When Nixon returned home, he set out on a career in politics. Step one for Nixon was the House of Representatives. He challenged Democrat Jerry Voorhis in a district that covered a large portion of the suburbs east of Los Angeles. Nixon painted Voorhis as a tool of labor, and, by extension, possibly involved with Communism. (Nixon and Voorhis held a debate at South Pasadena Junior High, now South Pasadena Middle School, which is about four blocks from where I am presently typing this.) Nixon won the election by 15,000 votes. In 1950, Nixon decided to run for the open California Senate seat. Nixon easily won the Republican primary. The Democratic candidate was Representative Helen Gahagan Douglas, who upset Los Angeles newspaper publisher Manchester Boddy. The Senate campaign would be a nasty one. Nixon came after Douglas hard, describing her as “the Pink Lady” because of the similarities in her voting record with Socialist Representative Vito Marcantonio. Of course, if you look at the roll call votes on any two members of the House, there will be a lot of similarities since many issues voted are procedural or the result of a compromise. Nevertheless, Nixon would claim that Douglas was “pink right down to her underwear.” Nixon won with 59% of the vote. Drew claims that most of Nixon’s efforts (through his campaign manager Murray Chotiner) were overkill as Douglas had little chance of winning anyway as 1950 was a down year for Democrats throughout the country. Also, Douglas had lost a lot of support among California Democrats as she was viewed as being too liberal. After just two years in the Senate, Nixon found himself on the national ticket as Dwight Eisenhower’s running mate. Eisenhower agreed to Nixon to satisfy the party’s conservative wing. Nixon’s anti-Communist credentials were strong; and, he was not considered as divisive of a figure as Joseph McCarthy. wealthy supporters had established a slush fund for Nixon and his family. (Nixon was far from the only person in Washington with one.) However, Eisenhower was thinking of dropping Nixon from the ticket because of the furor. 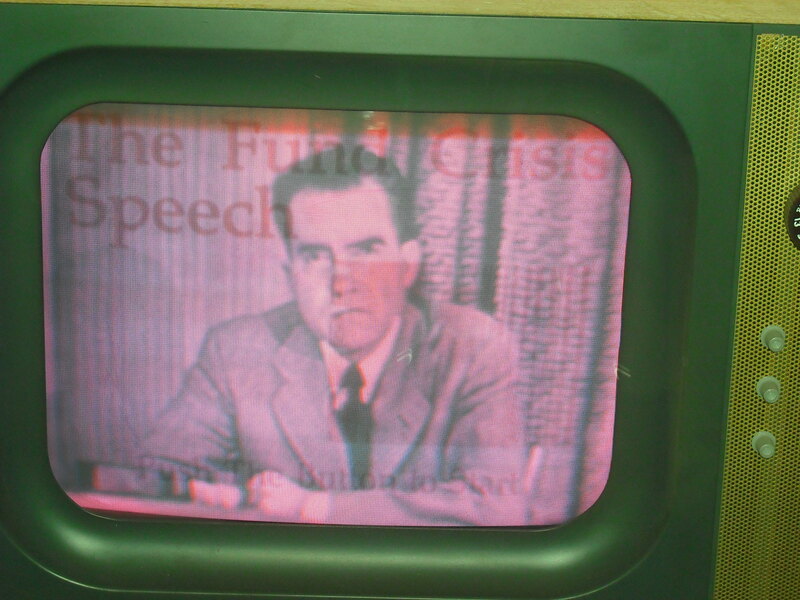 Nixon gave a public speech to address the problem. It went down in history as “The Checkers Speech” as Nixon insisted that the only gift he received that he did not give back was a dog named Checkers. (You can view the speech in two parts.) The speech was a big hit. Eisenhower publicly told Nixon that “You’re my boy!” And so, Richard Nixon was able to become Vice President. Eisenhower did not have much use for Nixon, and did not particularly like him. There was little for Nixon to do, even with Eisenhower’s questionable health. Nixon would make headlines when survived a hostile reception on a visit to Venezuela. Nixon’s motorcade was pelted with rocks. However, Nixon remained cool under pressure. In 1959, Nixon held an impromptu debate with Nikita Khrushchev about capitalism and communism. This would be dubbed the “Kitchen Debate” as it took place in a sample kitchen at a trade show in the Soviet Union. Nixon made his first run at the White House in 1960. Facing John F. Kennedy, Nixon narrowly lost. The 1960 campaign may be one of the most discussed in American history. And I already discussed it in the Kennedy review. So, go look over there. The losses to Kennedy and Brown reinforced for Nixon that the main reason he could not advance in politics was that the “Establishment” was out to stop him. This group consisted of Ivy Leaguers (like Kennedy) or the media (all forms of them whom Nixon felt were out to keep him from office and distort his views.) Later on, Nixon would begin to include Jews among his enemies. Nixon then started one of the country’s most remarkable political comebacks. First, Nixon moved to New York to increase his earning potential as a senior partner in a law firm. Nixon endorsed Republican congressional candidates. Nixon targeted 1968 as the year to start his comeback. With the country deeply divided over the Vietnam War, civil rights, and other social upheavals, the Republican nominee was going to have a good shot at winning the White House. Nixon’s principal competitors for the nomination were Michigan governor George Romney, New York governor Nelson Rockefeller, and California governor Ronald Reagan. All the competitors had their shortcomings. Romney was too weak. Rockefeller had too much baggage. Reagan was too inexperienced. Nixon won the nomination fairly easily. Much to the surprise of political pundits of the day, Nixon chose Maryland Governor Spiro Agnew as his running mate. Agnew had almost no national profile; but, Nixon liked some statements Agnew had made that made him appear to be tough on crime. Also, Nixon was trying for a “Southern Strategy” and hoped that Agnew would appeal to Southern conservatives. Late in the campaign, Humphrey broke with President Lyndon Johnson over the Vietnam War and publicly declared his intention to end U.S. involvement in Vietnam. Around this time, Nixon’s campaign, using Anna Chenault as a conduit, got word to the South Vietnamese negotiators in Paris that Johnson and Humphrey wanted to end the war. The South Vietnamese pulled out of the peace talks. The war in Vietnam would continue well past Election Day 1968. Nixon won the election in 1968, but by a narrow margin, 43.4% to 42.7%. This worked out to a little over 500,000 votes nationwide. Nixon earned 301 electoral votes to 191 for Humphrey. George Wallace won the other 45. Now that Nixon was in office, he had to face the task of running the country. The problem was that Nixon was more interested in the process of becoming President than actually being President. He appointed a Cabinet that was made up of lesser lights in the Republican Party. There were no Ivy Leaguers in the group with the exception of George Shultz, who was the Secretary of Labor. The Secretary of State, William Rogers, would be routinely ignored by Nixon. The Attorney General, John Mitchell, wanted to emphasize that the Justice Department was a law enforcement agency, even though he would turn out to be violating Federal laws in the process. Early on, Nixon had the chance to appoint a new Chief Justice. He chose Warren Burger, a conservative from Minnesota, whom Nixon thought would start to reverse the more liberal decisions of his predecessor, Earl Warren. In 1970, Nixon tried to appoint two different Southerners to another vacant seat on the Supreme Court: Clement Haynsworth and G. Harrold Carswell, but both were rejected for a combination of reasons, but primarily both of the men were considered incompetent. Nixon would finally appoint Harry Blackmun to the seat. And Blackmun would go on to write the majority opinion in Roe v. Wade. Drew examines Nixon’s attitude toward domestic policies and found them lacking. Nixon’s policies were actually quite liberal. The Environmental Protection Agency and Occupational Safety and Health Administration were created under Nixon and consumer protection laws were greatly expanded. Under the direction of Daniel Patrick Moynihan, welfare and poverty programs were revamped. The economy was in a strong inflationary period and unemployment was rising. Nixon tried to respond to this by imposing wage and price controls. He took the dollar off of the gold standard. Drew does not believe that Nixon actually thought much about domestic policy, except he just wanted to adopt plans that were politically popular. There was no overarching idea for what Nixon was trying to accomplish. She insists that Nixon’s domestic policy was the result of cynicism and political calculation and little else. What Nixon cared more about domestically were his political enemies. The White House became obsessed with monitoring the activities of Vietnam War protesters and other political opponents. Some of the ideas that Nixon and his aides developed for monitoring the opposition were considered too invasive even for FBI Director J. Edgar Hoover’s tastes. The White House under Nixon was an odd place. The President would send formal memos to his wife about how to arrange the living quarters. The memos would be addressed to “Mrs. Nixon.” Drew relates that Nixon, through the assistance of some of his well-heeled supporters, used Dilantin, an anticonvulsant, as an anti-anxiety medication, washed down with helpings of Scotch. (Dilantin is not prescribed for anxiety and all anticonvulsants now come with warning labels telling you two or three times not to mix it with alcohol.) Nixon was showing signs of erratic behavior very quickly into his Administration. Nixon always wanted to be viewed as a master of foreign policy. He relished the chance of negotiating with world leaders. And in this arena, Nixon tends to get the most praise from historians. Nixon also tended to give a lot of praise to himself in this field. Nearly all foreign policy initiatives from Nixon were orchestrated by National Security Adviser Henry Kissinger, the only person Nixon trusted in this field. The Vietnam War was far from over when Nixon was inaugurated. Nixon had promised to reduce troop levels in Vietnam in a process he described as “Vietnamization.” At the same time, Nixon ordered an expansion of the war into Cambodia. Protests over the expansion of the war into Cambodia turned into even more protests than during the Johnson Administration. A protest at Kent State University on May 4, 1970 resulted in the deaths of four people when Ohio National Guard troops fired on them. Ten days later, two student protesters were killed at Jackson State University in Mississippi. Other parts of the world were undergoing turmoil. Bangladesh was winning its independence from Pakistan in a bloody civil war that also involved India. Nixon, who did not like Indian Prime Minister Indira Gandhi, sided with Pakistan. It turned out that America’s desire to help Pakistan stemmed from a desire to use that country as an entree to an even bigger goal: relations with China. In February of 1972, Nixon traveled to China, where he conducted high level meetings almost entirely on his own. Nixon went as far to use the translators that the Chinese provided instead of State Department translators, whom he did not trust. The visit began the process of starting the normalization of relations between the U.S. and the world’s most populous country. The visit to China also made the Soviet Union more eager to negotiate with the U.S. on nuclear arms control. In May of 1972, Nixon went to Moscow. The Anti-Ballistic Missile Treaty and the first Strategic Arms Limitation Treaty (SALT) would be the results of these trips. The Plumbers talked a much bigger game than they actually performed. The group, led by men like E. Howard Hunt and G. Gordon Liddy, (to join the group you had to not like your original first name it seemed), fancied themselves to be world-class spies. However, their incompetence would be Nixon’s undoing. One plan the Plumbers came up with was to firebomb the Brookings Institution, a liberal think tank in Washington. The plan was to steal safes that were supposed to contain leaked information about the Vietnam War that scholars at the facility. However, the scholars neither had safes nor did they have any leaked confidential information. Another plan involved breaking into the office of the psychiatrist of Daniel Ellsberg, the former Pentagon employee responsible for leaking the Pentagon Papers. That proved to be a fruitless endeavor. On June 17, 1972, five men, including a White House official named Robert McCord were arrested at the Watergate Hotel trying to bug the office of Democratic National Party chairman Lawrence O’Brien. Six days after the break in, Nixon and aide H.R. Haldeman held the discussion linked here. In the summer of 1974, the House Judiciary Committee approved three articles of impeachment against Richard Nixon. After Nixon lost a Supreme Court battle to keep the tapes from being subpoenaed, a group of prominent Republicans in Congress visited Nixon and told him that he had to resign for the sake of the country. Hesitant at first to quit, Nixon relented. He announced his resignation on August 8, 1974, effective the next day. Nixon’s final days in the White House were not pleasant. His drinking became more severe. Secretary of Defense James Schlesinger told the Chiefs of Staff to run any orders from Nixon past him before enacting them. Schlesinger feared that an increasingly unstable Nixon could potentially involve the United States in a catastrophic war. After leaving office, new President Gerald Ford would issue Nixon a pardon for any crimes he may have committed while in office. Nixon retreated for a time to his home in San Clemente, California. Nixon had one more comeback of sorts left in him. After making a considerable sum of money for a series of interviews with David Frost, Nixon left California to move back to New York. Back in New York, Nixon would hold court and take on the role of the senior statesman. He wrote his memoirs and several other books on foreign policy. In 1981, Nixon, along with former Presidents Ford and Carter, flew to Egypt for the funeral of the assassinated Anwar Sadat. Nixon would offer advice to Presidents Reagan and Bush. Even when a Democrat, Bill Clinton, moved into the White House in 1993, Nixon was still trying to influence foreign policy. On April 18, 1994, Nixon suffered a severe stroke. Four days later, he passed away. He was buried on the grounds of his museum in Yorba Linda. President Clinton delivered a eulogy. Nixon could no longer see people kick him around. Drew concludes her book with the examination of Nixon’s Presidency. She calls it the “Yes, but” question. Would Nixon have been a great President, if not for Watergate. According to Drew, the answer is no. Nixon’s mental instability and extreme paranoia almost destroyed the country. Nixon wanted his legacy to be his foreign policy success in China and Russia. But, Nixon’s legacy is mainly just an almost complete distrust in our leaders by the American public. Nevertheless, Nixon’s historical profile is improving. The Ivy Leaguers that Nixon envied (or just hated) seem to be showing him more respect. Why this is so remains a puzzle to me. Other stuff: Because of a dispute between Nixon and the National Archives, the Richard Nixon Presidential Library and Museum was originally run by a private foundation. The National Archives took over the facility in 2007. Many parts of the museum are being renovated, including the section on Watergate. The facility is in Yorba Linda. Richard Nixon was considered to be a California resident when he was chosen Vice President; but, he was considered a New Yorker when he ran for President. In his three runs for the Presidency, Nixon received over 113 million popular votes, about 1 million more than George W. Bush had in his two successful runs for the White House. Franklin Pierce is a very difficult president to read about. There weren’t many biographies written about him. A man named Peter Wallner wrote a two volume biography of Pierce that was published between 2004 and 2007. However, that was two too many volumes I wanted to read about Franklin Pierce. Why? Because Franklin Pierce was simply an awful President. He had dubious qualifications for the office. He showed no ability to be able to perform the job. He had a governing style that either had him hiding his head in the sand and hoping that a problem would go away, or, confronting the problem by taking his right arm, extending it in front of him, and then further extending his middle finger. And, he was an alcoholic. After one term in office, his own party refused him renomination, the only incumbent President (elected version) to be saddled with that ignominy. I opted to read a 1991 book by Larry Gara, a history professor at Wilmington College (it’s in Ohio) who specializes in the antebellum era. Gara took on the thankless task of trying to make sense of the four years America had to suffer with Franklin Pierce at the helm. The resulting work was enlightening and entertaining. When you finish it, you think, “Wow, it couldn’t have gotten worse.” But, America certainly did get much worse under James Buchanan, leading up to the Civil War. Franklin Pierce was born on November 23, 1804 in Hillsborough, New Hampshire. His father served two terms as governor of New Hampshire. Pierce stumbled his way through his education and ended up at Bowdoin College, where he became friends with Nathaniel Hawthorne. By 1827, he had graduated from Bowdoin and had set up a law practice in Concord, New Hampshire. Pierce quickly got into politics, winning a seat in the New Hampshire General Court at the age of 24. He became Speaker of the House of Representatives in New Hampshire after two terms. He then parlayed that into a House seat in Washington in 1833, and then into the Senate in 1837. It’s not that Pierce was a shrewd legislator. But, he was a nice guy. And his father was famous. In 1834, Pierce married Jane Appleton, the daughter of the president of Bowdoin College (not the woman depicted in the linked video). Jane was never well. They had three children. The first son died in infancy. The second died at the age of four of typhus, and the third died in a train accident at the age of 11 a few months before Pierce was inaugurated. Because of his delicate family situation, Pierce resigned from the Senate in 1842. Pierce practiced law and gave speeches endorsing candidates, but little else. Gara also asserts that Pierce’s alcoholism had begun to develop, in part to cope with his difficult home life and also to ward off the boredom of living in Washington at the time. (Washington Nationals baseball was still years away.) Congress was rife with alcoholics at the time, Daniel Webster being the most famous one. When the Mexican War started, Pierce enlisted as a private, but was quickly made a general. This wasn’t because he was a military genius, but rather because he was somewhat famous. He suffered a severe hip injury during a battle. He twice tried to ride into battle without sufficient treatment and passed out from the pain. Pierce was sent back home to New Hampshire, but he was now an officially certified war hero. Even though nobody really knew what he did. And he drank more to ease the pain. By the time of the 1852 elections, American politics was a mess. Although there were nominally two parties: the Democrats and Whigs, there were almost a dozen different factions from each party that coalesced around various themes: slavery, expansion, nationalism, internal improvements, and the always popular organized beatings of immigrant Catholics. Slavery was the most divisive issue obviously. The acquisition of territory from Mexico made Northerners afraid that the South would use that area to increase the spread of slavery. More slavery meant more political and economic power for the South. As Gara pointed out, very few of the opponents of slavery actually wanted free blacks living among them. They just didn’t want the South to increase its power. However, both the Democrats and Whigs were national parties. So, neither could take a stand for or against slavery without losing significant amounts of support. The result was that slavery was pushed far into the background by the two parties. Incumbent Whig President Millard Fillmore had no shot at the nomination. The Whigs wanted to nominate someone with flash and pizzazz. They turned to another hero of the Mexican War, Winfield Scott. While Scott did perform well in Mexico, he was a horrible candidate for President. He didn’t earn the nickname “Old Fuss and Feathers” for having a dynamic personality. The Democrats had numerous candidates for the nomination, but none of them were particularly attractive. Illinois Senator Steven Douglas, former Secretary of State James Buchanan, and Michigan senator Lewis Cass (who had lost in 1848) were some of the candidates you may have heard of. And then there were a bunch that you hadn’t heard of. At the Democratic Convention in Baltimore, there was a deadlock. The supporters of Cass and Buchanan wouldn’t budge and the voting continued ballot after ballot. On the 35th ballot, a faction of the party known as Young America (because they were young, not because they would have descendants who were David Bowie fans) decided to put Pierce’s name into nomination. The Young Americans were a nationalist and expansionist wing of the Democratic Party. Douglas had been their standard bearer, but Douglas had ticked off too many people. So, they decided to make Pierce their candidate. It took until the 49th ballot before the supporters of Cass and Buchanan gave up and gave Pierce the nomination. Why Pierce? Why him? It seems that New Hampshire Democrats felt that they were owed consideration for the Presidency since the state had been such a reliable Democratic vote in the last few elections. Pierce happened to be the most notable politician from the state. Also, Pierce was quite fond of the South and Southerners and would not fall in league with abolitionist forces. You may wonder if Pierce was actively seeking the nomination. As far as I can tell, he was not NOT seeking the nomination. When Pierce found out the news, he convinced his wife to go along with the plan (which was hard to do) and he accepted the nomination. William King of Alabama was nominated as Vice President. King was an odd choice as he was suffering from tuberculosis. And he was very ill. But, he was needed to balance the ticket. Pierce won the election rather easily over Scott with over 50% of the vote to 43% for Scott. Free Soil party candidate John Hale, a rival of Pierce in New Hampshire, took the rest. In the electoral vote, Pierce won 254 votes to 42 for Scott. Pierce won New Hampshire, but Scott won Vermont. This showed, even in 1852, that New Hampshire and Vermont are two states that only look like they should be similar. In reality, they are both populated by kooks. Before the election (as mentioned above) Pierce’s last surviving son was killed in a train accident. He and his wife were hurt, but not too badly. However, this death cast a pall on his administration. His wife rarely ventured out in public. Pierce tried to find solace in alcohol more and more often. Vice President-elect King was so ill that he visited Cuba in an attempt to regain his health. Congress passed a law allowing him to be sworn in there. But, it was to no avail. King died 45 days after taking office. Pierce did assemble a Cabinet that was better than what you would expect. His Secretary of State William Marcy, who knew next to nothing about foreign affairs, actually did a decent job. However, his Secretary of War was Jefferson Davis (a personal friend), ended up acting much like the vainglorious racist he would later become as President of the Confederacy. The rest of the Cabinet was loyal. Pierce is the only President to serve a full term in office and have no changes in his Cabinet. After his inauguration, Pierce faced numerous crises, but the most pressing one was solving the problem of the expansion of slavery in the territories. The Compromise of 1850 was supposed to have delayed that problem for a while, but Congress couldn’t leave well enough alone. Douglas proposed what would become known as the Kansas-Nebraska Act. The Nebraska Territory (which was very large) would be split up and each section would have its inhabitants vote on whether or not slavery should be allowed in the territory. Douglas proposed the bill because he thought it would ease the way for building a transcontinental railroad. Douglas was beholden politically and financially to speculators who wanted to build such a railroad. Davis wanted to build a similar railroad, but he wanted it through the South. Southerners descended upon Kansas and set up makeshift towns. Enough them got together that they claimed to have formed a government. A proposed state constitution was sent to Washington. It required anyone holding office in Kansas to own slaves. It also made speaking out against slavery illegal in the state. Pierce thought all of this was OK by him. Congress refused to accept the proposed constitution. Eventually, pro and anti-slavery settlers poured into the state. Nobody knew who was in charge. But, they did like shooting at each other. The territory became known as “Bleeding Kansas.” Pierce was flummoxed that instead of easing tensions in the slavery debate, all the Kansas-Nebraska did was to escalate tensions. Pierce was flummoxed on most days, however. Pierce was also presented a bill that would have established a Federally funded system of hospitals to care for indigents who suffered from severe mental illness. This was the pet project of Dorothea Dix, one of the most respected women of the day. Pierce vetoed the bill stating that the Federal government couldn’t help everyone in need and it was a state responsibility. However, months later Pierce would sign into law bills granting Mexican War veterans favorable pensions and land deals. Pierce was in favor of the Federal government helping out poor people who could still vote. And looked nice. Another issue that came up was enforcement of the new Fugitive Slave Law. This law, part of the Compromise of 1850, required anyone anywhere in the United States to return a slave to its owner with barely any involvement in the legal process. One case in Boston in 1854 saw a mob try to prevent a Fugitive Slave “commissioner” from returning a slave to the South. Pierce ordered in Federal troops to send the man back to the South and slavery. Pierce believed that preserving the “property” rights of the South were superior to the human rights of any one person. But, Pierce didn’t believe the man in custody was a person. About the only area where Pierce wasn’t a total disaster was in foreign affairs. Fortunately, Secretary of State William Marcy was competent to run his office, even though his diplomatic corps consisted of people such as a failed Presidential candidate in Buchanan; a French national who somehow still managed to qualify to serve in the Senate, Pierre Soule; and a man who spent his time writing novels, Nathaniel Hawthorne. Marcy, through Minister to Mexico James Gadsden, expanded U.S. territory by purchase a strip of land (the Gila River Valley) in southern Arizona and New Mexico. This territory was not part of the land ceded from the Treaty of Guadalupe Hidalgo. However, it was needed because surveyors determined that any Southern route for a transcontinental railroad would have to pass through it. Gadsden almost pulled off a deal that would have added Baja California and Sonora to the U.S. as well, but the Mexican government balked on dealing that area after American filibuster William Walker tried to claim the area as an independent republic. Also, under Pierce’s watch, an American naval expedition under the command of Commodore Matthew Perry steamed to Japan (sent under orders from President Fillmore, but it took a while to get there) to open relations with what had been a hermit kingdom. The United States was able to establish trade, although not at the most favorable ports, and helped to bring Japan into the international community. Pierce and Marcy had to deal with filibusters (using the original meaning of the word, not the delaying tactic in the Senate) in Nicaragua and Cuba. In Nicaragua, Walker tried to set up another republic for him to be in charge of, but he was eventually forced out when he lost the support of Cornelius Vanderbilt (who owned extensive shipping interests in the area), and that in turn caused Pierce to withdraw American support. No filibuster expedition took over Cuba, but it seemed that Pierce wanted one. Marcy, along with Buchanan, Soule, and Minister to France John Mason, met in Ostend, Belgium to discuss acquiring Cuba. The men agreed that the U.S. should offer to buy the island or, if Spain refused, take it by force, either overtly or through a filibuster. This supposedly secret talk was quickly leaked to the press and became known as the Ostend Manifesto. Once Northerners heard of it, anti-slavery politicians saw it as another land grab for slaveholders. The plan was quickly dropped as other European powers expressed opposition. If it seemed that Franklin Pierce could do nothing well, why did he become President? Gara looks to the political climate of 1852. The nation was undergoing rapid changes in its economy. Railroads were changing transportation. The telegraph was changing communications. Immigrants were changing the demographics. But, the government hadn’t adapted to these changes. Keeping matters calm was paramount. However, more was needed. Leaders with a vision for the future were needed. But, the political system wasn’t set up to create one. Politicians of the time didn’t want to confront problems. They just wanted to keep people happy. But, they weren’t happy. They hated each other. There was a battle for economic control of the country with black slaves as the weight that tipped everything in the South’s favor. Political leaders of the 1850s weren’t picked because they were smart or good leaders. They were picked almost solely because they were popular. And Franklin Pierce was popular. Or at least he was after some marketing. However, once Pierce was forced to take office and actually try to deal with issues, it was apparent that he was hopelessly in over his head. He had no political base of support. There was no “Pierce Machine.” There was just one guy, Franklin Pierce, who drank a lot. Pierce had few friends in Congress. His wife was bereft with the loss of her children. Pierce was out on his own. And he was not up to the task. Pierce was barely considered for renomination in 1856. James Buchanan, who was actually a worse President than Pierce, came back from England to become the 15th President. Buchanan mixed Pierce’s incompetence with a dash of graft and a heaping teaspoon of arrogance to break the country in half. Pierce spent the rest of his life in New Hampshire where he was mostly ignored. He was accused of being a Southern sympathizer and an angry mob surrounded his house after Abraham Lincoln’s assassination when Pierce refused to hang a flag surrounded in black trim in memory of the slain Executive. Pierce claimed that he didn’t have to fly a flag to prove his loyalty. The mob dispersed. They likely knew that Franklin Pierce’s bigger problem was that he had to live with his own conscience. Pierce died on October 8, 1869 of cirrhosis of the liver. I found Gara’s book to be fascinating and one of the best I’ve read about a President. Gara doesn’t try to defend Pierce or rationalize his actions in any way. Gara knows that Pierce was a poor President. In a less contentious time, Pierce may have just been mediocre. But, the slavery question turned Pierce from mediocre to horrible. Franklin Pierce may be one of the least-known Presidents. But, maybe it’s all for the best. However, part of me thinks that Americans should know what kind of leaders we are capable of choosing if we don’t pay attention to what is truly important. America got Franklin Pierce as President, and the country deserved him for failing to realize that half of the country was living a life based on the idea that real live human beings were just “property.” Slavery had long been a slowly festering illness that was destroying the United States. By the time Pierce took office, the illness had become acute. It would get worse before it got better. Other stuff: The childhood home of Pierce is part of a park run by the state of New Hampshire called The Pierce Homestead. The home Pierce owned in Concord is called the Pierce Manse and it houses the New Hampshire Political Library. Pierce is buried in the Old North Cemetery in Concord. Lyndon Baines Johnson was President for just a little over five years. However, if you try to read some of the biographies that have written about him, you may feel like you need five years to get through all of them. Robert Caro has written three volumes of a biography on Johnson, and he hasn’t even gotten Johnson into the White House. That’s 2,555 pages just to get you through the 1950s. I read an excerpt from the third volume once on a flight home from New York to L.A. I don’t even think I had enough time to finish. Or, quite possibly, there was a good in-flight movie. Robert Dallek managed to fit Johnson’s life into two volumes. Dallek’s works stretch for 1,456 pages. Randall Bennett Woods opted to go the one volume route. That book is just a little over 1,000 pages long. Johnson’s own memoirs (ghost written by a young Doris Kearns, who had not yet married former Johnson aide Richard Goodwin) for the time of his Presidency are a piddling 636 pages. Was the book more or less objective? Was the book about all of Johnson’s life? Would I experience severe and/or potentially disabling back pain while carrying it around? The book LBJ: A Life by Irwin and Debi Unger passed all three tests, especially the important third test. This book runs for just 586 pages. It covers Johnson from his birth to his death. Although it’s somewhat sympathetic to Johnson, it’s not a hagiography. Still, you get the feeling that there is so much more that can be said about one of the most potent forces in 20th Century American politics. Lyndon Baines Johnson was born on August 27, 1908 in a city his ancestors founded in the Texas Hill Country. As people with great imagination, they called the town “Johnson City.” Lyndon’s father was Sam Ealy Johnson, Jr., a member of the Texas State Legislature. His mother was named Rebekah Baines, which provided him with his middle name. Young Lyndon did well in the Johnson City schools, but didn’t wish to go to college at first. He ran away from home, and found work in places like San Bernardino, California. He hoped that a family friend would be able to get him to pass the bar in Nevada, which had rather low standards in the 1920s. But, Lyndon Johnson ended up back in Johnson City when that plan failed. Reluctantly, Johnson enrolled at Southwest Texas State Teachers College (now called Texas State University) in San Marcos, Texas. While it wasn’t nearly as prestigious as the nearby University of Texas, it was a school that Johnson’s parents could afford. And, even with its lower admission standards, Johnson still needed a full year of preparatory classes. In college, Johnson would first demonstrate one of his ways of getting ahead. He would find an older authority figure (in this case, the university president), befriend him, and then use those connections for personal advancement. Johnson graduated from college in 1930. He had been deeply involved in campus politics. But before he could make politics his career, he needed to get a job first to establish himself in the community. So, he worked as a high school history teacher in Houston. From this position, he parlayed that connection into a job in Washington as a secretary for a Texas House member named Richard Kleberg. After making himself indispensable to Kleberg (who wasn’t very interested in doing much work), Johnson got himself appointed to be the head of the National Youth Administration work program in Texas. The NYA was a Roosevelt New Deal program that employed thousands of college age men and women in a variety of public works projects. Along the way, he met a woman named Claudia Taylor. Everybody called her “Lady Bird,” a nickname she picked up at birth. Johnson was attracted to Lady Bird for a variety of reasons. She had access to money. She understood politics. She was intelligent, a University of Texas graduate. She would improve his station in life. The two were married in 1934. She would always be called be Lady Bird Johnson from then on, so she could have the same initials as her husband. They would have two daughters, Lynda Byrd and Luci Baines. In 1937, Representative James P. Buchanan (no relation to the former childless President) passed away. This left an opening for Johnson to run for a House seat back in his home district in the Hill Country. Johnson won the special election and became the youngest member of Congress at the time, just 27 years old. Johnson caught the attention of President Franklin D. Roosevelt, who was looking for more sympathetic members of Congress from the South. Some New Deal programs were starting to face opposition from conservative Southern Democrats. Roosevelt took Johnson under his wing, helping out with projects back in his district. Johnson, in turn, became one of Roosevelt’s staunchest supporters in Congress. Johnson also became friends with Sam Rayburn, who would soon become Speaker of the House. Both Roosevelt and Rayburn took something of a paternal interest in the young Texas representative. In 1941, Johnson decided to run in a special election to fill a Senate seat left vacant by the death of Morris Shepard. Governor W. Lee “Pappy” O’Daniel appointed Andrew Houston, an 87-year old descendant of Sam Houston, to hold on to the seat until an election could be held. Johnson assumed O’Daniel himself wouldn’t run for the seat, but that was not the case. Johnson seemed to have won the election when the polls closed. However, O’Daniel had enough connections throughout the state to get enough counties to change their vote totals just enough to push him over the top. Lieutenant Governor Coke Stevenson, who wanted to move up to the Governor’s office, massaged the vote totals. O’Daniel would win by about 1300 votes. Since it was a special election, Johnson held on to his House seat. When World War II began, Johnson temporarily left his office in the hands of Lady Bird while he served in the Navy. (Johnson was a member of the Naval Reserve and had served on the Naval Affairs Committee.) Johnson spent most of his time on the West Coast, but was sent out in 1942 to do some observation in Australia, where he was invited on a bombing run. One of the two planes sent up was shot down and Johnson’s plane was damaged, but landed safely. General Douglas MacArthur awarded Johnson a Silver Star for his efforts. Roosevelt ordered all members of Congress in the Armed Forces back to Washington soon after. By 1948, Johnson felt it was time to make another go at the Senate. He knew he couldn’t wait around in the House to move up the ladder. O’Daniel wasn’t going to run for reelection as he turned about to be something of a joke. Johnson would face off against the incumbent governor, Coke Stevenson. (Coke was his given name. Texas politicians had very cool names at this time. There was also a governor named Beaufort Jester around this time. ) This election would be epic. Caro and Dallek both devote hundreds of pages each to the event. I will try to be more brief because you have likely already stopped twice while reading this to go to the bathroom. The election was a battle between the conservative establishment of Texas in Stevenson and a more progressive style favored by Johnson. Johnson toured the state by helicopter, a novel method at the time. His face was omnipresent. At the same time, Johnson was suffering from a painful attack of kidney stones. Somehow, Johnson was able to work through the pain for most of the campaign. Eventually, he would go to the Mayo Clinic for the still experimental treatment of having the stones removed with a cytoscope. This was actually the second method tried. The first was to drive Johnson over a lot of bumpy roads with the aim of dislodging the stones. In the end, Johnson missed two weeks of the campaign, although the normal recovery time during that time for kidney stone surgery was six weeks. Johnson quickly worked his way up the ladder in the Senate. He befriended Georgia Senator Richard Russell, who had no family (similar to Rayburn), and learned from him. Russell would prove to be far more conservative than Johnson on civil rights issues, but the two men remained friends until the late 1960s. After just two years in the Senate, Johnson was voted Minority Whip. And in 1952, when Democratic Senate Leader Ernest McFarland was defeated for reelection in Arizona by Barry Goldwater, Johnson was chosen as Senate Minority Leader. Johnson developed a reputation as a forceful leader who was able to work well with Republican President Dwight Eisenhower. In 1955, the Democrats regained control of the Senate and Johnson became Majority Leader at the age of 46. Many historians consider Johnson to be the most effective Majority Leader in the Senate’s history (the position didn’t exist until the 1930s). The Majority Leader sets the agenda for the Senate and has great control over its actions. Johnson strongly believed that Congress should get things done. He did not wish to obstruct the Eisenhower Administration, although he did always keep an eye out for the interests of the Democratic Party. Johnson was an adept vote counter and master of persuasion. He developed a way of speaking to people known as “the treatment.” He would get very close to a person and speak directly to their face. He was not afraid to touch other Senators or lean into them. The linked illustration shows Johnson giving “the treatment” to Rhode Island Senator Theodore Green in 1957. Green was 90 years old at the time. After his first session as Majority Leader, Johnson had worked himself so hard, he ended up suffering a heart attack. He rested for the second half of 1955, but made a triumphant return to the Senate in 1956. In 1957, he was able to push through the first major civil rights bill through Congress since Reconstruction. Although the Civil Rights Act of 1957 was far from revolutionary, it served notice to Northern politicians that Johnson was not a typical Southern segregationist. Southerners looked at Johnson’s actions in the Senate as an act of betrayal. Johnson was constantly driven to seek higher office in part because he feared dying young, like his grandfather and father. So, in 1960, Johnson made a bid for the Presidency. However, Johnson, the master politician, didn’t understand that Presidential nominees weren’t going to be chosen exclusively in backroom deals as they had before. Johnson’s younger Senate colleague, John Kennedy, ran in primaries and used his success in them to make himself a viable national candidate. It also had the effect of eliminating the competition, in particular Minnesota Senator Hubert Humphrey. When the Democratic Convention convened in Los Angeles in 1960, Johnson still thought he had enough delegates that he could win nomination on a second or third ballot. But, Kennedy’s forces were better organized and outmaneuvered Johnson to get the nomination for the young Bostonian on the first ballot. Then, for reasons that are still debated, Kennedy offered Johnson the Vice Presidential slot on the ticket. Did Kennedy offer Johnson the spot figuring that he’d be turned down anyway? Did Kennedy think that Johnson would help him with Southern voters? Nobody seems to know for certain. But, Johnson accepted the spot, and became Vice President on January 20, 1961. Johnson hated the Vice Presidency. He found out that there was little to do. He wanted to serve as the head of the Democratic Senate Caucus, but was told by his old colleagues that such an arrangement could not work. Even worse, Johnson felt marginalized and belittled by the Easterners in the Kennedy Administration. Everything changed on November 22, 1963. John Kennedy was assassinated in Dallas, Texas. Prior to the trip, Johnson was hoping that Kennedy would take him off the ticket in 1964. Now, he was President. After the initial mourning period for Kennedy, Johnson set to work to implement some of Kennedy’s policies, most importantly a civil rights bill. Johnson wanted Kennedy’s Civil Rights Bill to be adopted in part as a memorial to the slain President. Johnson used his Senate connections to avoid a Southern filibuster. Most importantly, Johnson got Republican Senate Leader Everett Dirksen to back the bill. The Civil Rights Act of 1964 prohibited discrimination in any public facility, in employment, and in government. Although the Act still had many loopholes and would be toughened up throughout the years (including today), it was a landmark bill nonetheless. Johnson’s biggest fear about the Civil Rights Act was that it would be eventually turn Southern whites from reliably Democratic to reliably Republican voters. However, Johnson knew that to be elected President in his own right in 1964, he would need to have accomplishments of his own. Johnson was both realistic, in that he knew that it was impossible to ride into office on the memory of John Kennedy, and proud, in that he wanted to show the Kennedy people that he could do more than their leader. The Great Society was supposed to be Johnson’s legacy to the United States. There would be hundreds of government programs established in the fields of education, welfare, conservation, agriculture, and, most importantly, health care. But, the Great Society had a counterpart when it came to government spending: the Vietnam War. On August 2, 1964, a Navy destroyer, the U.S.S. Maddox, was fired upon by North Vietnamese forces in the Gulf of Tonkin. (A second attack on a different ship supposedly took place, but that has been denied by the Vietnamese.) Johnson knew that in an election year, he could not allow an attack on an American vessel go without retaliation. So, Johnson asked Congress to give him the authority to use force to assist any member of the Southeast Asia Collective Defense Treaty, i.e. South Vietnam. Congress passed a joint resolution giving Johnson the authority to send more troops to Vietnam with the Tonkin Gulf Resolution. There were only two dissenting votes. Johnson ordered the bombing of several North Vietnamese supply sites. This then developed into a larger bombing campaign. And then more soldiers were added on the ground. And so on. Back at home, Johnson faced conservative Republican Senator Barry Goldwater in the 1964 election. Goldwater had emerged from an unusually contentious campaign. The 1964 Republican Convention in San Francisco would see Goldwater’s supporters boo New York Governor Nelson Rockefeller. Goldwater took a very hawkish position on the war in Vietnam and facing off against the Soviet Union overall. Goldwater’s most controversial position was advocating giving field commanders the authority to use nuclear weapons, albeit low-level ones. Nevertheless, Johnson jumped on this suggestion to paint Goldwater as a dangerous man hell-bent on sending the world into nuclear annihilation. This led to one of the most infamous political ads in television history, the “Daisy Girl Ad.” The ad ran only once. But it did its job. Johnson routed Goldwater in the election, winning over 61% of the vote. But, in a foreshadowing of America’s political realignment, Goldwater won five Southern states. With overwhelming Democratic majorities behind him, Johnson started to enact a dizzying array of proposals. The most durable legacy of this time period was Medicare, the first time the Federal government was providing health insurance to civilians on a wide scale basis. Health insurance had been backed by both Roosevelt and Truman, but it took Johnson to push it through. Johnson also had the Voting Rights Act passed in August of 1965. This measure removed many barriers to registration for African-Americans throughout the country. It was one of Johnson’s proudest moments. And, a few days after it passed, the Watts district of Los Angeles exploded in racial violence. The racial violence that would mark Johnson’s term in office from 1965 to 1969 deeply disturbed Johnson. But, it wasn’t because Johnson felt that there was more work to be done in the area of civil rights and poverty. Rather, Johnson felt that African American voters were not suitably grateful for all the hard work Johnson had done for him. Johnson seemingly always a politician who saw every issue in terms of trading off favors to different sides so something could be done. Despite all of Johnson’s social programs, his term in office is remembered primarily for the Vietnam War. Johnson was fearful of being the first U.S. President to lose a war. (James Madison seemingly gets credit for a tie.) Johnson kept seeing parallels in Vietnam to World War II. The “Domino Theory” was an accepted way of thinking in the Johnson Administration. If Vietnam fell to Communist forces, the rest of Southeast Asia would follow. Secretary of Defense Robert McNamara, a holdover from Kennedy’s Cabinet, tried to figure out some way for the U.S. to “win” while fighting a “limited” war. But, a solution was nowhere to be found. According to the Ungers, the situation in Vietnam sent Johnson into deep depressions after dealing with it. As much joy that Johnson received from his Great Society programs, Johnson felt a corresponding amount of pain over Vietnam. The Ungers even go as far to assert (without much documentation) that Johnson suffered from a very mild form of bipolar disorder. Johnson was also reported to have made aides stand beside open bathroom doors while he defecated as he gave dictation. He also was reported to deliberately stand up at seemingly random times in meetings to force political opponents to stand up and sit down repeatedly in an effort to annoy them. Whatever was troubling Johnson, many of his aides sensed that Johnson was mentally unstable. Richard Goodwin and George Ball were advisers who left the Administration feeling that Johnson’s mood swings were too difficult to deal with. Johnson would describe people like Goodwin and Ball as disloyal. Protests over the Vietnam War became larger and more widespread after 1965. Senator William Fulbright of Arkansas held public hearings to examine the conduct of the war. The American effort in Vietnam appeared to accomplish little. Early in 1968, there was a cease fire in the war to observe the lunar new year in Vietnam, a period called Tet. During the cease fire, the North Vietnamese unleashed a major offensive, catching much of the South Vietnamese forces unprepared. However, American forces managed to repel most of the North Vietnamese forces. Johnson was going to run for reelection in 1968, but antiwar Democrats had already found a candidate to run against Johnson. Their first choice would have been Robert Kennedy, now a New York Senator after leaving his post as Attorney General in 1965, but he declined, feeling that Johnson was unbeatable. Minnesota senator Eugene McCarthy decided to take on Johnson. In the New Hampshire primary on March 12, 1968, Johnson was a write-in candidate (which was not unusual at the time) against McCarthy. Johnson won by a 49-42 margin, a surprisingly small margin for an incumbent President. The results were interpreted as a condemnation of Johnson’s Vietnam policies, although some historians think that much of the anti-Johnson vote came from people who felt that Johnson was too weak in his approach to Vietnam. On March 16, Robert Kennedy announced his candidacy. Johnson knew that it was time to get out. Also, he had thought of not running anyway because of a fear of dying in office. The rest of Johnson’s administration would be marked by tragedy. Martin Luther King was assassinated on April 4. Robert Kennedy would be killed on June 6. The Democratic Convention, which nominated Johnson’s Vice President, Hubert Humphrey, would be marked by violence. Johnson didn’t think that Humphrey would make a good President. He hoped that Nelson Rockefeller would get the GOP nomination. But, Richard Nixon would be the Republican candidate. Reluctantly, Johnson backed Humphrey, although he felt betrayed when Humphrey announced a peace plan in a speech on September 30, 1968. (Johnson felt betrayed a lot.) Johnson sincerely believed that his efforts in Vietnam were in the country’s best interests. Nixon would narrowly defeat Humphrey in the 1968 election. Johnson would retire to his ranch in Texas, where he worked on his memoirs and tried to repair his legacy. His retirement was not long. He suffered a second heart attack in 1972 that left his heart beyond repair. He passed away on January 22, 1973. He was 64 years old. It was the same age that a team of actuaries told him his life expectancy would be when he was weighing a run for a second term in 1968. And with all of my ramblings here, I think I only covered the tiniest fraction of the life of Lyndon Johnson. And with all that has been written about him, there are so many places to turn to find information on this most complex man. Lyndon Johnson’s life was full of contradictions. It seemed that for every step forward, he took a step or two backward. He definitely got things done, but the question is: did he do the right things? Other stuff: The Lyndon Johnson Presidential Library and Museum is part of the University of Texas in Austin. It’s open every day but Christmas. Lyndon Johnson’s ranch in Johnson City, Texas is now the Lyndon Johnson National Historical Park. There is also a Lyndon Johnson Memorial Grove on an island in the Potomac River. Lyndon Johnson was 6′ 3.5″ tall, the second tallest of any U.S. President, behind only Abraham Lincoln. Johnson would bring his own oversized bed (seven feet long) on all foreign trips with him.